Tomato sauce and tomato puree are very similar products, since they are both made of cooked and strained tomatoes. The differences lie in the consistency, flavor and culinary uses. Knowing the difference between tomato sauce and tomato puree helps you understand which ingredient to use in which types of dishes. Tomato puree is a thick sauce made from tomatoes that have been briefly cooked, pureed and strained to remove the seeds and peels. Tomato puree from a can lacks both the bright, acidic flavor of fresh tomatoes and the rich, sweet flavor of tomato paste, made from tomatoes that were cooked and reduced to a thick paste over a long period of time. 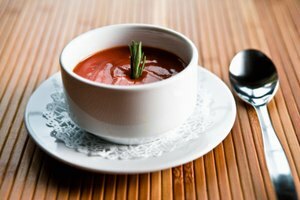 Because of its thick consistency and bright red color, tomato puree adds body and color to sauces, soups and stews, but not much pronounced tomato flavor. Tomato sauce is thinner than tomato puree. 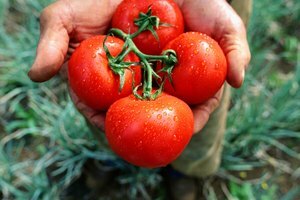 Unlike tomato puree and tomato paste, which are made simply from cooked tomatoes and maybe a bit of salt, tomato sauce is seasoned with herbs, spices and vegetables, such as garlic, oregano, basil and onion. You can usually find jars and cans of tomato sauce in the grocery store in a wide variety of flavors, ready for you to serve on top of pasta. The most important difference between tomato sauce and tomato puree is that tomato sauce is pre-seasoned. If you must add a tomato product to a recipe, consider the herbs and spices in the tomato sauce and whether they work with the other flavors in the recipe. 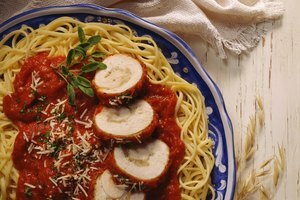 Since store-bought tomato sauce usually comes in Italian flavors, it might not work well in other cuisines, such as Indian or Greek. For this reason, tomato puree is best used as a recipe ingredient, where it blends with other flavors, while tomato sauce is best used as-is. It's easy to make your own tomato puree and tomato sauce, so you can season them however you like. To make tomato puree, cut out the part of the tomatoes where the stem attaches, and cut a cross in the bottom of the tomatoes. Boil the tomatoes for 3 or 4 minutes, then shock them in ice water. Remove the skins, puree the tomatoes in a food processor, and strain out the seeds. To make tomato sauce, sauté vegetables in olive oil, such as onion, garlic and grated carrots. Add salt, thyme, basil and other seasonings you like, along with peeled, fresh or canned tomatoes. Simmer about half an hour, or until the sauce reaches the right consistency.